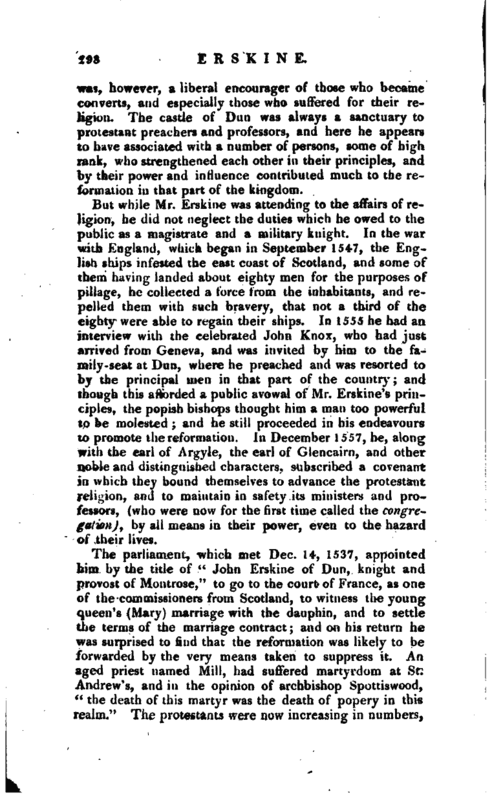 , baron of Dun, the ancestor of the preceding, and one of the protestant reformers in Scotland, was born at the family-seat near Montrose, in 1508, or 1509. His father was John Erskiue, of Dun, a descendant of the earls of Marr, and his mother was a daughter of William, first lord Ruthven. He was educated most probably at the university of Aberdeen; and according to the ancient custom of the nobility of Scotland, pursued his studies for some time in one or other of the foreign universities. 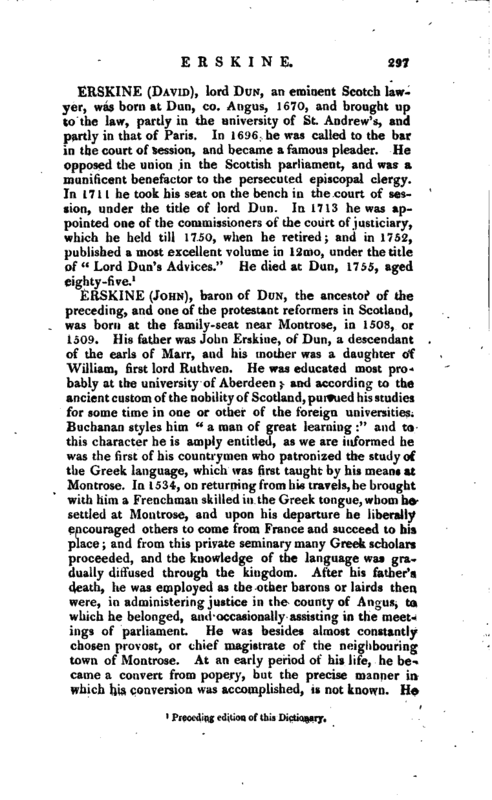 Buchanan styles him “a man of great learning:” and to this character he is amply entitled, as we are informed he was the first of his countrymen who patronized the study of the Greek language, which was first taught by his means at Montrose. In 1534, on returning from his travels, he brought with him a Frenchman skilled in the Greek tongue, whom he settled at Montrose, and upon his departure he liberally encouraged others to come from France and succeed to his place; and from this private seminary many Greek scholars proceeded, and the knowledge of the language was gradually diffused through the kingdom. After his father’s death, he was employed as the other barons or lairds then, were, in administering justice in the county of Angus, to which he belonged, and occasionally assisting in the meetings of parliament. He was besides almost constantly chosen provost, or chief magistrate of the neighbouring town of Montrose. At an early period of his life, he became a convert from popery, but the precise manner in which his conversion was accomplished, is not known. He | was, however, a liberal encourager of those who became converts, and especially those who suffered for their rehgiou. The castte of Dun was always a sanctuary to protestant preachers a-.id professors, and here he appears to have associated with a number of persons, some of high rank, who strengthened each other in their principles, and by their power and influence contributed much to the reformation in that part of the kingdom. 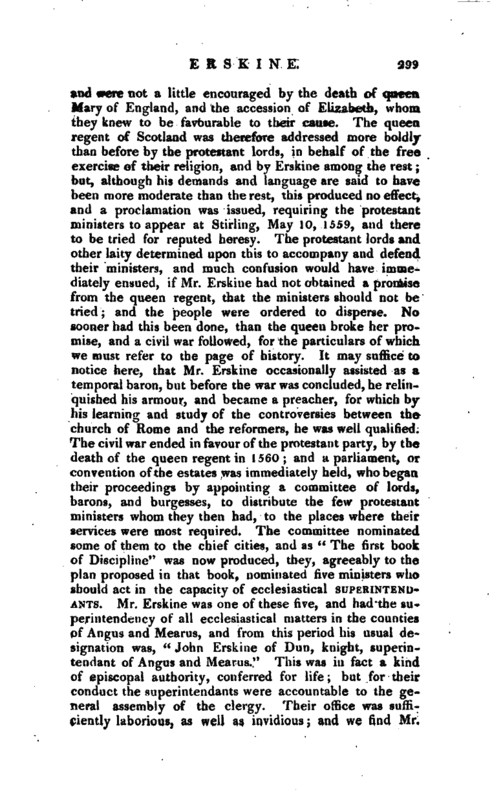 But while Mr. Erskine was attending to the affairs of religion, he did not neglect the duties which he owed to the public as a magistrate and a military knight. In the war with England, which began in September 1547, the English ships infested the east coast of Scotland, and some of them having landed about eighty men for the purposes of pillage, he collected a force trom the inhabitants, and repelled them with such bravery, that not a third of the eighty were able to regain their ships. 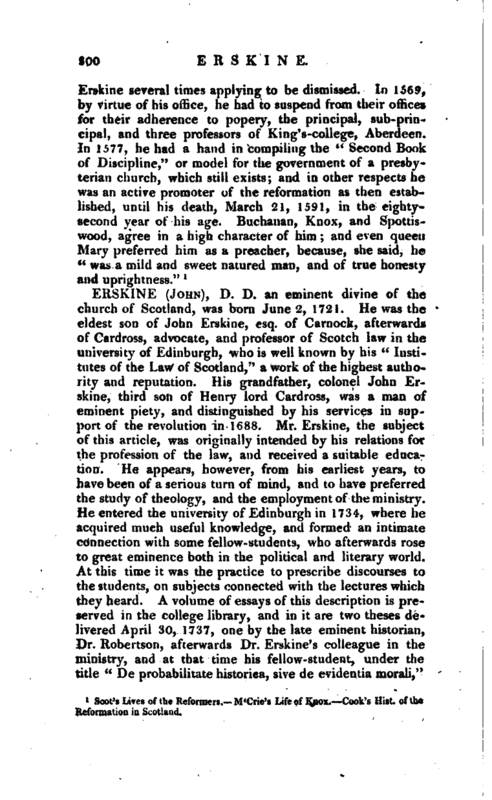 In 1555 he had an interview with the celebrated John Knox, who had just arrived from Geneva, and was invited by him to the family-seat at Dun, where he preached and was resorted to by the principal men in that part of the country; and though this atVorded a public avowal of Mr. Erskine’s principles, the popish bishops thought him a man too powerful to be molested; and he still proceeded in his endeavours to promote the reformation. In December 1557, he, along v?ith the earl of Argyle, the earl of Glencairn, and other noble and distinguished characters, subscribed a covenant in which they bound themselves to advance the protestant religion, and to maintain in safety its ministers and professors, (who were now for the first time called the congregation) t by all means in their power, even to the hazard of their lives. Scot’s Lives of the Reformers. M‘Crie’i Life of Kndx.-^Cok’s Hist, of the Reformation in Scotland.